She told eTurboNews: Today, as I watch the funeral train carrying the late President 41 George Herbert Walker Bush, I’m transfixed to a time far far away. A gloomy raining April 12, 1945, President Franklin Delano Roosevelt passed away. Later that week, the president’s casket was carried its own train car, with a military honor guard. Honor guards of military units and members of the public including my mother and me, gathered along the route of the train traveled first to Washington for a small funeral service at the White House, then to FDR’s funeral and burial in Hyde Park, N.Y.
Today more memories of the past are flooding my mind: This is my memory when I first visited with President-Elect George Herbert Walker Bush. The 1988 race against Democrat Michael Dukakis was notoriously ugly in Hawaii, especially because of a series of “Willie Horton” ads. Dukakis won the election in Hawaii with a solid 10 point landslide. However, the election results in Hawaii stood out from the rest of the United States in that election. Vice President George H. W. Bush, the Republican, won. As a rule presidential electors, part of the Electoral College, do not attend the inaugural of an incoming United States president, especially one of a different party. However, I received an invitation. Even if the Democratic candidate did not win, I wanted to go. Hawaii Governor John Waihee assisted in gathering lei, pineapple and Hawaiian Host candies as gifts to the new president. And off I went, facing the January cold in a borrowed fur coat. The Capitol security guard in Washington D.C.who had been watching the exchange between the young greeter and me was having trouble wiping the grin off his face as he lifted the boxes, and off we went to the office of the outgoing Vice President Bush, who had an office in the Capitol Building, just outside the Senate chamber. 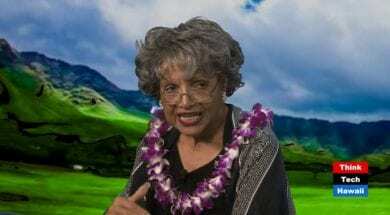 “Funny, you do not look like a Republican”: the young white man said, looking up at this Black woman laden with boxes of Lei, pineapple and Hawaiian Host candies; as only people of Hawaii do when visiting. “I’m not,” reaching out to hand him my invitation. I took a deep breath and tried my best not to laugh. He blushed, turning beet red, all the while fumbling with the check-in list and attempting to pull back the words. In those days, Republican Electors were not African American, Latino, and Asians. “Mr. President-elect, this young lady came all of the way from Hawaii to see you,” the security guard said, handing him the gifts. “Hello, please excuse the confusion — movers are transferring me out of this office and into the White House,” he said. Much to my surprise, George Herbert Walker Bush was as gracious and warm as a long-lost friend. This was not the man I expected, as we had fought so hard against him during the presidential campaign. He showed me a few pictures which were left from the movers. He became emotional talking about how his first visit to Hawaii was as a result of being shot down by Japanese fighter bombers and being plucked out of the ocean by a submarine while in the Navy during World War II. I told him my husband served 20 years on submarines. We were now kindred souls. As a parting gift he gave me a copy of the inaugural edition of “President Bush’s Point of View,” a collection of quotes of his vision for the coming administration. On October 27, 1990 a lei-draped visitor, President George Bush arrived in Honolulu. It’s a book I have treasured all of these years. 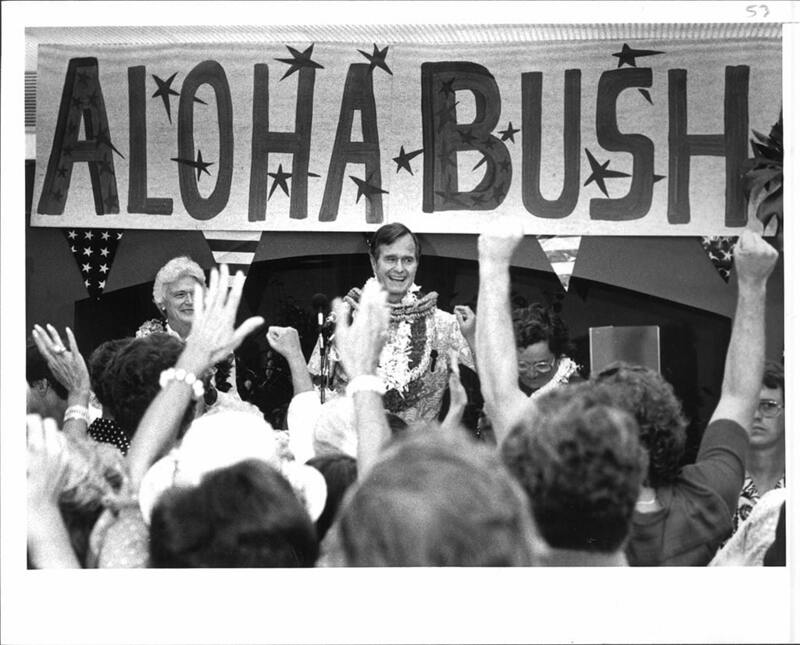 President Bush lived the Aloha Spirit! Aloha is a special word and way of live in Hawaii. Aloha was the last word Hawaii Senator Inouye spoke before he died.